Try your hand in the Creamline Lottery! You might have seen us shouting about our Creamline Lottery winners and wondered what all the fuss is about. It’s all about having fun and helping people along the way – by joining in you’ll be supporting local charities and good causes across the North West! 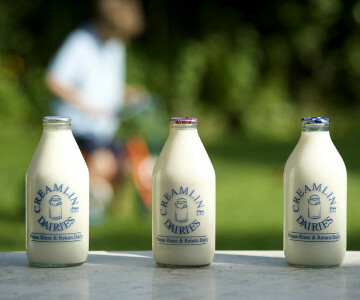 We’ve been running our lottery for years with our doorstep milk customers, and we’re still going strong today! As a company we’ve donated hundreds of thousands of pounds to local charities and paid out hundreds of thousands of pounds to our customers. By signing up with the Creamline lottery, you’ll be supporting our principal charities, Francis House Children’s Hospice and St Ann’s Hospice, who provide respite, relief and support to Manchester families at the hardest time in their lives - as well as being in the running to win weekly cash prizes. As well as supporting our principal charities, we’ve also helped a whole host of other initiatives, including the Salvation Army’s work with the homeless in Manchester, Age Concern Salford and the Hope Hospital Brain and Spinal Injury Fund, as well as smaller community groups and schools. Half of all the ticket sales are paid out in prizes, with a weekly draw of several £100 and £50 prizes and a 10 weekly larger draw with a top £1000 prize and then a number of £500, £250, £100 and £50 prizes as well. A nice surprise with your morning delivery! Add a set number of 20p lottery tickets to your weekly basket (minimum weekly order is 5 tickets). You’ll be given your (hopefully!) lucky lottery numbers, for the duration of your membership (you’ll be billed each Friday - head to Creamline’s Ts & Cs page to find out more). Details of the lucky winners will be shared on Creamline’s News page, with weekly prizes sent out in the post to the winner’s registered address. Margaret Beck, Community Events Officer, St Ann’s. “Francis House is grateful to Creamline Dairies for their continuing support and dedicated service”. Head here to join the Creamline Lottery!